We took Maya to Seattle for our Christmas holiday. 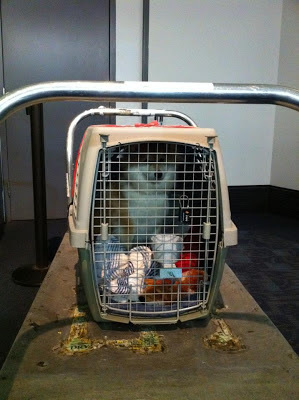 Though it was a short flight, we were really nervous because of all the bad stories we heard. Fortunately, everything went pretty smoothly, except for the little delay due to the heavy fog in San Francisco on our way back. We were worried that it might be stressful for Maya, but she did her usual stuff (sniffing, pulling, trying to greet everyone that walked by) as soon as we let her out, so I guess it wasn't too bad. Call the airline before booking the tickets to ensure they have space for pets on the flight. Call the airline again after booking to reserver a space for the pet. Health certificate. Long story stort: we just took Maya to the vet 3 days before finalizing our trip and thought we could just call and ask for a certificate. Apparently not. We had to go in for another appointment and spend extra money for the doctor to do the exact same exam and give us an expensive piece of paper, which the airline only glanced at for 2 seconds. 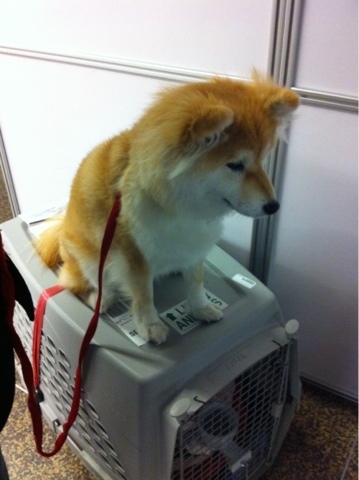 Crate: big enough for the pet to stand up and turn around without touching the top. 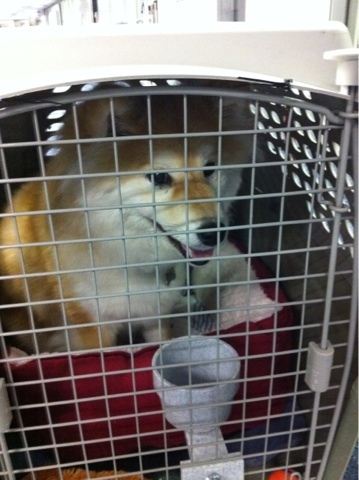 Food/water bowl attached to the crate door. Arrive at least 1 hour before departure time. Check in at the counter: fill out some forms, pay the fees, and get the boarding passes for the humans. Security check: at SFO an airline personnel escorted us over and hauled Maya back when done; at SEA the security check was right next to the counter so we walked over on our own and left Maya there afterwards. They asked us remove Maya from the crate and checked everything that was placed in it. Lock the crate: at SFO the security guy came out with those plastic wire ties and locked the crate for us; at SEA we had to ask for the ties and locked the crate ourselves. After saying goodbye to Maya, we did our usual stuff: security check, wait, wait, wait, get on the plane, take off, touch down, wait, wait, wait, get off the plane, etc. Before taking off, a flight attendant brought us a small paper slip notifying us that Maya was on the plane. It was very considerate of the airline and definitely made us less worried. The whole experience was okey, at least for me. The only compliant I have is the money spent: $100 each way plus $80 for the health certificate (though I got it done cheaper, thanks to livingsocial), while our own ticket was only $250. However, having Maya with us for Christmas was priceless! May I ask which airline you flew to Seattle?